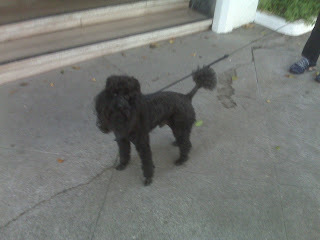 I asked his owner if I could take a picture but she said she was in a hurry because she was going to......a conference? What? That's the absolute worst excuse ever to not have somebody take a picture of your dog. I was insulted, the dog was insulted, and something else was insulted. If anybody needs to be going to a conference, it's him. Look at that dog. He is a bass player in a death metal band. He probably cooks his own meals, and hers. I love this entry. Cute and funny! At the first look, I thought he was Julius. But soon realized he was totally different guy.